Are you thinking about skydiving for the first time? It’s an incredible experience that you won’t regret. It will change the way you think and stick with you for the rest of your life. But before you grab your car keys and head to the nearest drop zone, here are six tips for first time skydivers you need to know before you go. 1. What Is Skydiving Like? Our first tip is to forget everything you think you know. People will talk about what they think skydiving is like before they’ve done it. They say things like ‘I bet I’ll be scared when we get to the door’ or ‘Isn’t it funny how you go up when you pull your parachute’ (this one’s a myth – you don’t go up at all). The reality is that you simply can’t explain what skydiving is like. It’s an experience beyond any other, nothing like anything you’ve done before. So approach it with a completely open mind, and enjoy! You’ve probably been to a carnival before. There are loads of rides for you to try out, each one offering something a bit different. When you go to the carnival, you can try as many rides as you like and rarely require instruction to do so. Skydiving isn’t a carnival ride. It’s incredibly fun but it’s also a serious sport that needs to be taken as such. You’ll receive a brief prior to your jump which you’ll need to pay attention to so you know exactly what’s going to happen. There is a misconception that tandem skydiving means being attached to an instructor and simply hanging there and going along for the ride. Of course, much of this is true; you will be attached to an instructor and they will be responsible for the operation of the parachuting equipment. But you will also play a role. During your tandem skydive brief, you’ll be told about your required body position for exit. You’ll learn about the position you need to adopt in freefall. You’ll practice picking your legs up for landing. It’s important that you arrive for your tandem skydive ready to play an active role, so wear comfortable clothing and make sure you listen during the brief! 4. 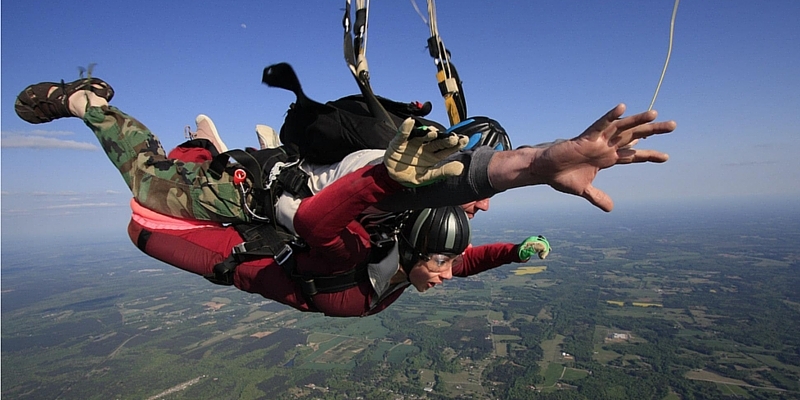 You Can Breathe During A Skydive! One of the most common misconceptions we hear about skydiving is that you can’t breathe while doing it. There are people who are overcome by the sensation to the extent that they hold their breath. But there is absolutely no reason why you wouldn’t be able to breathe. It’s simply a matter of opening your mouth and doing it! We tell our tandem students to try screaming on the way out of the plane, to remind you to breathe and prove that you can. Skydiving is an amazing thing to do. The feeling you’ll get is difficult to capture but the views and the look on your face when you’re jumping can be captured – on camera! Trust us, it’s well worth buying a photography and video package for your jump. You’re going to be really excited on the day of your jump. You might feel like you’re even too excited to eat. Remember, it’s important you eat normally on the day of your skydive to keep your energy levels up. Drink plenty of water to keep you alert too. Also, it’s important to make your way to the drop zone in plenty of time so you don’t find yourself running late. Weather can have an effect on the timing of your jump, so don’t plan anything too soon after the time of your jump as you can’t know for sure what time you’ll be done. We hope these skydiving tips help you get the most out of your first time skydiving experience. If you’re ready to skydive Georgia with the best, book your tandem skydive online today or contact a member of our team with any questions you have.